In the Future, International Airline Travel Will Actually Be Fun Again. No, Really. Traveling abroad is inherently thrilling — but then there’s that interminable, soul-sucking trek to get there. In the future, things might be very different. Imagine an eight-hour flight that’s actually enjoyable, with ergonomically designed seats and an in-flight entertainment system that syncs to your personal devices. You could get through security faster with biometric scanning. Land in a foreign airport that’s more like a museum, replete with robots and holograms. Then hop on a comfy super-fast maglev train to your robot-staffed hotel with your pocket-sized translator in hand. Sound far-fetched? It’s not, really. Because there’s more of us traveling than ever. According to a 2014 study conducted by Oxford Economics, the global travel industry is set to increase 5.4% each year for the next 10 years, outpacing global GDP growth. The UN World Tourism Organization said over a billion humans traveled internationally in 2014, and it’s a number expected to go up by nearly 5% this year. With all those people getting more passport stamps, there’s a market, and a need, to better accommodate tourists. Here’s what you can look forward to. Flying is also overpriced, cramped and uncomfortable, and turbulence might actually increase thanks to climate change. The good news is there are some new plane designs meant to address those problems. First, emissions: Earlier this year, Pricewaterhouse Coopers forecasted that air traffic will double in the next 20 years, and to reduce all those atmosphere-destroying pollutants, aircraft engineers are looking toward alternative energy — namely that green slimy wonder-fuel, algae. Algae emits nearly 70% less carbon dioxide than petroleum-based fuels. It’s already happening: Back in 2011, United Airlines made history with the first-ever algae-fueled passenger flight from Chicago to Houston. Meanwhile, Japanese startup Euglena — named by that country’s Prime Minster Shinzo Abe as his “favorite” startup — is looking to commercialize algae biofuels within the next five years. Rethinking the basic shape planes can also make them lighter, more aerodynamic, and less of a fuel drain. Take this 2012 design from NASA and MIT, called the “double bubble.” It’s a popsicle-looking plane with two fuselages. Shrunken wings, an upturned nose, and reducing Mach to 0.72 from 0.80 can cut a fuel use by a whopping 70 percent compared to a Boeing 737, according to MIT and NASA. The designers hope to have the plane in the skies by 2035. Another concept design teased earlier this year uses wings that use a shape-shifting design to adjusts their position so the plane uses less fuel. A collaboration among NASA, the U.S. Air Force Research Lab, and Michigan engineering firm FlexSys Inc., the teams want to make planes that can automatically adjust the wing flap angles at certain points during the flight to make it more aerodynamic. Meanwhile, in this video, Airbus took the idea of a concept plane and ran with it, imagining seats made of recyclable plant fibers that can be grown into a certain shape, along with bird’s eye view observation decks. Biomimetics is another way engineers are looking to nature to make machines lighter, more agile, and more efficient. Earlier this year, Airbus unveiled a conceptual biomimetic plane that models plane bodies after bird bones — by the year 2050, Airbus envisions a jet body that’s hollow like the inside of a bird’s bone, making it lighter and more fuel efficient. The future isn’t all sunny skies filled with wacky birdplanes, though. Climate change throws a wrench in the plan. For transatlantic travelers, the jaunt across the pond will likely be way bumpier in the coming decades. Scientists predict greater turbulence over the Atlantic due to abnormal climate patterns. In 2013, a study from the University of Reading in England found that incidences of turbulence could double due to the changing climate. An Australian Transport Safety Bureau study last year also described an “unprecedented” increase in turbulence in the last two years, though a potential cause was not listed. While turbulence can be scary and knock over your tomato juice, it’s not really dangerous. But if you’re like me and you wet yourself at even the slightest jolt, the future looks brighter. The Los Angeles Times reported this summer that new software sends weather data from planes to folks on the ground that help other planes avoid the rough air. Pilots often relay back brushes with turbulence after they’ve made it through the choppiness, but this new technology transmits reports in real time, the Times reports. Getting from point A to point B has, in a lot of ways, gotten way more uncomfortable over the years: Checked bag fees, gross food, more crowded flights. But entertainment technology has made the hours in a pressurized metal tube more bearable. And travel technology experts say that, as entertainment tech gets more integrated with each other, the more personalized experience it means for you. This could get tricky, he says, because airlines could start leverage big data to force you into airline customer loyalty, just like Apple and Google try to tie us to our ecosystems already. “For example, Star Alliance airlines could sign a deal with Apple, whereas SkyTeam airlines could do the same with Android, to ensure they got the customers’ to stick with them,” Brierly says. 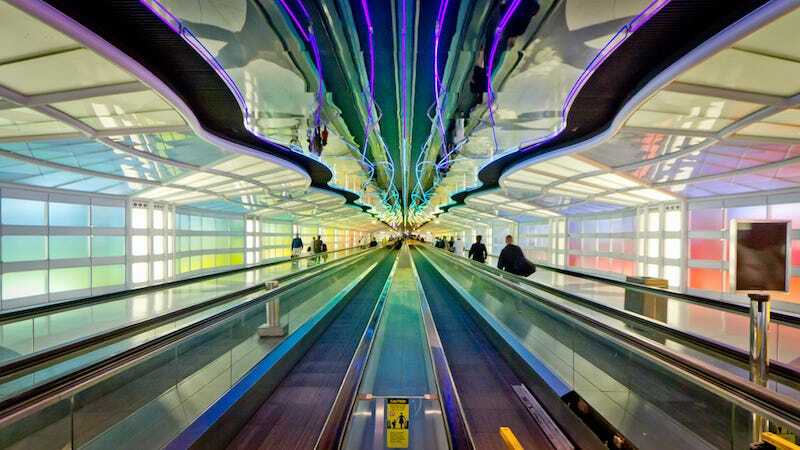 The world’s airports are getting a makeover. The BBC reports that airport operators around the world have invested $7 billion in IT investments, and we’ll be seeing that money coming back to us with features like automated check-in, beautiful airport lobbies, and helpful robots. Earlier this year, Tokyo’s Haneda Airport started rolling out robots that ferry your luggage, give you directions, and more. Some airports have even introduced hologram assistants. I was in Miami this summer and was startled when I saw this hologram. Yes, I had downed three cans of Heineken at 30,000 feet, but I distinctly remember walking through arrivals at 9 PM and seeing a small crowd gathered around a flickering, glowing 2D image. Is that a hologram? I thought. “She” didn’t really do much besides smile, though she did serve as a prime Instagram subject. And while airports aren’t exactly known for being good for the environment, that could change in the coming years, too. Over in the Galapagos, its airport is solar-run and low-emission. Built in 2012, CNN reports that 80% of the facility’s infrastructure is made from recycled materials and has a desalination plant that transforms nearby seawater into usable water. These transit hubs of the future will be beautiful hangout spots, not soul-sucking vacuums filled with Orange Juliuses. Airports may start resembling mini-cities. Some will get bigger, like New York’s LaGuardia (voted by Gizmodo readers as America’s worst airport, so things can only go up from here). Meanwhile, there will be brand new airports — and they will be huge. For example, Dubai’s Al Maktoum International, aka “Dubai World Center,” will cost $32 billion and open in 2027, serving 160 million passengers per year, making it far and away the busiest airport on Near Future Earth. The UAE’s Abu Dhabi Midfield Terminal could handle 40 million passengers annually, and is one of the upcoming “mega-airports” in the Middle East that’ll serve as major international travel hubs. Nowadays, our passports and credit cards are embedded with tiny microchips that brim with a treasure trove of personal information. It’s a crook’s dream. How will we protect ourselves while traveling? RFID—or radio frequency identification technology—has been in use for decades, and today it’s found in bank cards, security access cards, and yup, passports. It involves embedding a chip in the document, and the concern for years has been tech-savvy thieves using RFID readers to steal your personal information via radio waves that RFID-embedded documents emit. But researchers at Madrid Polytechnic University are toying with a new biometric that’ll add an extra layer of protection that’ll help spot swiped passports, and hopefully prevent crooks from getting through security your stolen personal information: They’d need your personal odor, too. It’s more accurate than facial recognition, but the researchers say the sensors aren’t as effective as, say, police dogs. Passports might be a lot prettier, too, as Norway’s gorgeous passport redesign showed last year. The Canadian passport incorporated something the Norwegian one did, too—awesome hidden art embedded into the pages, fully revealed only under a black light. It’s more than just an aesthetic Easter egg. It’s yet another security firewall. The multiple pages of multiple UV-reactive inks are a sign of authenticity. Okay, so you touched down in foreign soil. Time to have some fun. But one of the biggest obstacles of international travel? Language barriers. If you’re visiting a foreign land where you don’t know ni hao from n’est-ce pas, the future has some extremely handy gadgets. The key is getting something that’s actually in our hands as we roam the streets with nothing but a Lonely Planet, our wits, and a smartphone. We previously reported on Japan’s plans to arm the 900,000 foreign visitors with portable deciphers for Tokyo’s 2020 Summer Olympics. Panasonic’s making pocket-sized instant translators that convert your native language to Japanese in the blink of an eye. In the same vein, Google rolled out a smartphone app early this year that instantly translates signs in foreign languages into English, simply by pointing your phone’s camera at the indecipherable signage. Still, reliable, fast translation software is tough. Just like human translating and interpreting, there are a lot of challenges, ranging from obscure sentence structure, slang words, cultural references, and situational nuance that, even if translated, could still leave non-native speakers scratching their heads. There’s still plenty that could get lost in translation. Who can help us? Robots! Multilingual androids on staff at hotels, shops, and airports can lend us a hand when humans or translation gadgets can’t. In California last year, home improvement giant Lowe’s started experimenting with something called OshBot, a robotic sales associate that uses a viewfinder that scans items you’re looking for so it can direct you to the right aisle. The international applications aren’t limited to helping foreign customers on the spot, showing people where items are: it can also connect you instantly via videophone to a human sales associate that speaks your native language. Hotels will also be staffed with translation stations, or robots who speak many tongues. This one at a theme park in Japan with dinosaur receptionists is one of the goofier examples, but the country is looking to get additional professional talking androids in the halls of hotels and malls in the next five years. If the trends continue, the future will be home to some amazing trains —including really fast ones. The US High-Speed Rail Association says that 24 countries are developing HSR, from Turkey and Saudi Arabia to Portugal and Argentina. So when you leave the airport to go into the city, the chances of it being a bullet train will be higher. For those of us visiting the US from abroad, in the near future we may be able to enjoy the same high-speed rail that’s long been in operation in Europe and East Asia. California’s currently constructing a line linking Los Angeles and San Francisco, while Texas is working with the makers of Japan’s bullet train to plop a replica in the Lone Star State joining Houston and Dallas. Just last month, a consortium of Chinese companies announced plans for high-speed rail servicing Las Vegas and the LA area, while the Japanese government wants to help bankroll a maglev train between Baltimore and Washington, DC. Governments and companies with fantastic high-speed rail want to export their trains overseas: like Japan (who has the oldest, most punctual and safest high-speed trains in the world) and China (who’s been running their amazing maglev train, still considered pie-in-the-sky sci-fi for most of the world, in Shanghai for a whopping 11 years). For example, Japan’s shinkansen is planned to be brought to Thailand, and China’s bringing its tech to Turkey. Of course, a lot of this should be taken with a grain of salt — like all emerging technologies, it takes a while to become widespread and achieve affordable price points for companies and individuals to make them realistic. But many of these technological and infrastructural advancements — like algae fuels, mammoth airports, and assistive androids — are already in the works. Teleportation may not happen any time soon, but this stuff is pretty cool too.